A TEPCO worker checks contamination around a water tank at Fukushima on September 4, 2013. Japan has pledged a renewed push to contain potentially hazardous leaks. TOKYO (AFP) – (AFP) – Japan pledged a renewed push to contain potentially hazardous leaks at Fukushima on Tuesday after the operator of the crippled plant reported spiking levels of radiation in groundwater. Late on Monday, two days after Tokyo won the bid to host the 2020 Olympics, plant operator TEPCO announced samples taken from a well at the site showed the presence of radioactive substances, including strontium, a known carcinogen. Reports said the utility believed it “now seems more likely” that leaks from tanks storing highly polluted water had made their way into subterranean water, which flows out to sea. The contamination level compares with government limits of 100 becquerels per kilogramme in food and 10 becquerels per litre in drinking water. Experts say, if consumed, strontium accumulates in bones and can cause cancer. The continuing nuclear catastrophe at Fukushima has come under the international spotlight in recent weeks as Tokyo fought off challenges from Madrid and Istanbul for the right to host the 2020 Games. Speaking to Olympic chiefs in Buenos Aires ahead of their decision to award the Games to Tokyo, Prime Minister Shinzo Abe said the situation at Fukushima was “under control”. On Tuesday his ministers huddled to discuss the decommissioning of the plant and its waste water crisis, Chief Cabinet Secretary Yoshihide Suga said. “We will consider ways to utilise the knowledge of people in and out of Japan… and to enhance our international communication on the waste water issue,” Suga told reporters. 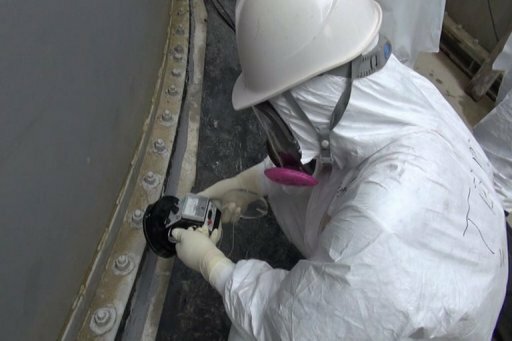 Thousands of tonnes of radioactive water are being stored in temporary tanks at Fukushima. Much of it has been used to cool molten reactors at the plant wrecked by the earthquake and tsunami of March 2011. TEPCO and Japanese officials are considering releasing some of it into the Pacific Ocean after filtering out radioactive materials, but face opposition from fisherman and neighbouring countries. The operator said last month that around 300 tonnes of mildly polluted water is running into the Pacific Ocean every day as a result of groundwater flowing underneath the stricken reactors and out to sea. The Japanese government said last week it would spend $470 million on a scheme to freeze the soil around the reactors to form an impenetrable wall of ice they hope will direct groundwater away from them. But the admission that water from the tanks holding the highly polluted water appears to be contaminating groundwater risks complicating that operation. Suga on Tuesday stressed that ocean water samples taken off Fukushima coasts had not shown dangerous levels of radioactive materials.